1 & 2 Woodleigh Cottages, Dowgry Rd, Clough, Ballymena, BT44 9SJ. 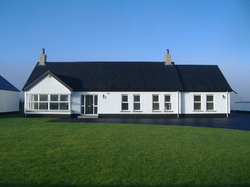 Only 2 Energy saving traditionally constructed low carbon cottages. Solar panels for domestic hot water. High efficency condensing oil fired boiler. 3 Bedrooms (1 with ensuite). Future 1200sq ft attic conversion. No 1 already sold. No 2 already sold. Average heating costs £4.46* per week.